Hi everyone! So glad you have joined us here today. Haven't the projects been fantastic and the inspiration over the top! For my first project I wanted to showcase the cute little Petite Petals Stamp Set and the Petite Petals Punch from the Occasions Catalog. I am really going to enjoy having this little set! 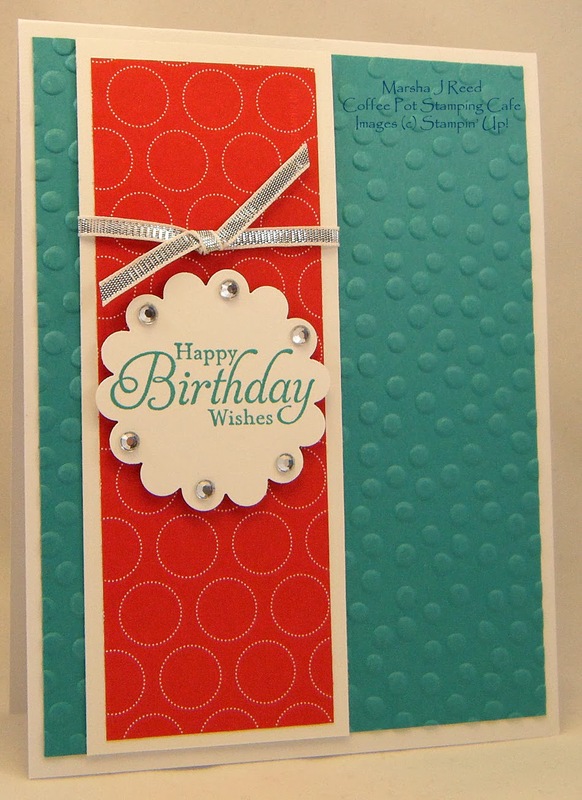 My next card features one of the products you can get free during Sale-A-Bration, the Decorative Dots Embossing Folder. It is so different from the Perfect Polka Dots Embossing Folder in that the dots are random and not neatly spaced. I really like the way it looks. I used the sketch I found at Unscripted Sketches for this card. Sometimes when I'm making a bunch of cards at one time, I look for some inspiration from a sketch or color challenge to help me out. With February 14th not far off, I thought it quite appropriate to share a Valentine Card with you. Gorgeous Grunge made for some terrific backgrounds and this is a sketch I found over at Freshly Made Sketches. Well, there you have it for me. Now head on over to your next stop to see what Heidi Weaver has in store for you, just click on her name under the watercooler! Thanks so much for joining us on our Wacky Watercooler Welcome 2014 blog Hop. And, thanks for stopping in at the Coffee Pot Stamping Cafe. Great projects, Marsha. I love that Petite Petals card. Definitely going to CASE that! Very pretty cards, Marsha! Love the happy colors in the birthday card. Wonderful creations Marsha. I especially love that you used Gorgeous Grunge on the Valentine! I need to CASE that. Marsha, I love your projects! I think my favourite is the 1st card; I'm going to have to get that Everything Eleanor set - that flourish is lovely! Thanks for sharing. I love your cards, especially the Valentine. Marsha, I love that petite petals card. It looks wonderful with the Eleanor swirl and the hexagon e.f. Welcome to our blog hop, Marsha. It's wonderful to have you with us. I love the variety of cards which you've created. The first one is so feminine with the combination of Everything Eleanor and the Petite Petals bundle. 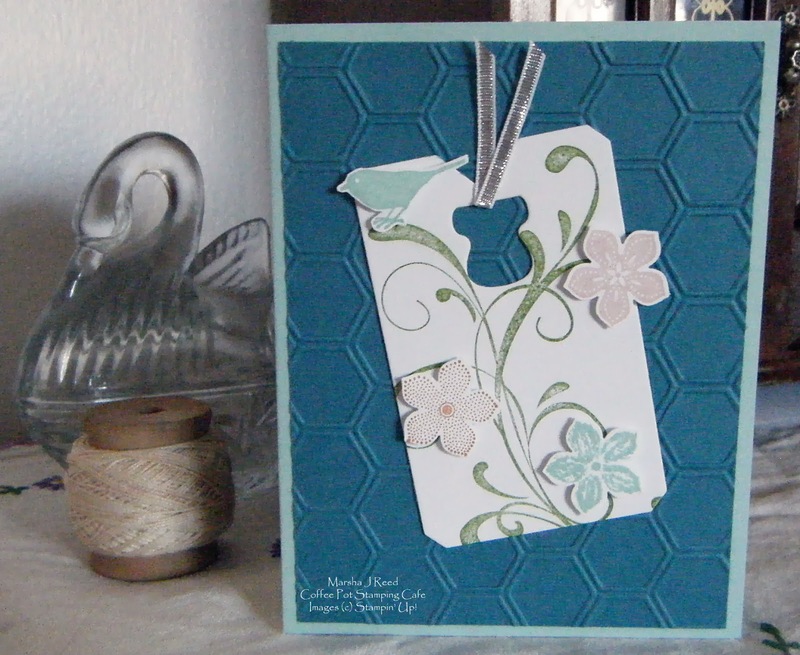 What a good idea to put that detail on the tag from Chalk Talk and put it on top of the hexagon embossing. I can see that Decorative Dots embossing folder becoming one of my favourites during Sale-a-bration (and beyond). I love the random dots. They add so much to the card, don't they? 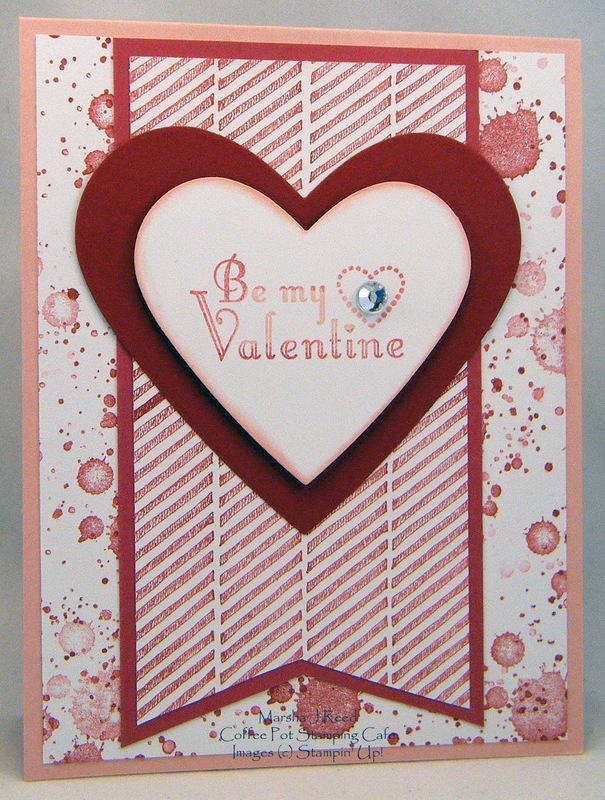 I love the way you've used the Gorgeous Grunge as your background for the Valentine card. That stamp set has definitely grown on me. Hi Marsha. I'm so glad you were able to join the hop. Welcome! You make grunge look "gorgeous"! All the projects look wonderful and I'm hard pressed to pick a favorite. The new Petite Petals stamp and punch really make Everything Eleanor something special and you've now officially made me want that new SAB Decorative Dots folder. Love that birthday project. Gorgeous Grunge though may have stolen the show. What wonderful background papers you created using that set. The perfect Valentine for the guy or gal in your life. You've really given us something for everyone. Thanks again for hopping! Marsha, it is great to see your work again. I love your grung card. Love what you've shown us here. Especially like the color choices for your first card, that dark background helps the tag and flowers stand out. And grunge for a Valentine card! I may have to CASE that. Thank you for all the ideas.